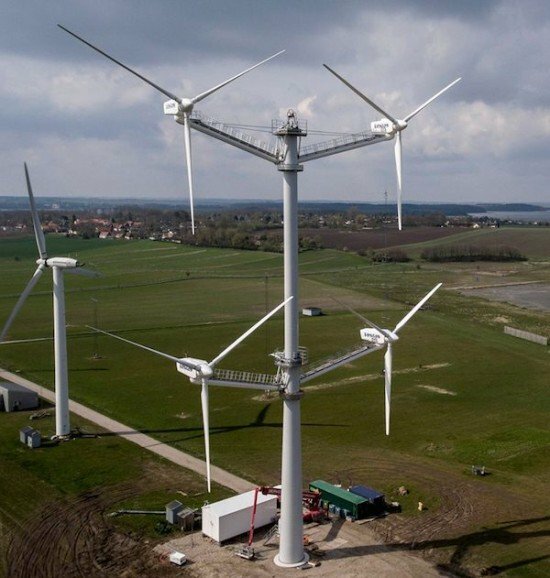 I always believed that wood towers for wind turbines were a solution possible only in small, domestic WTGs (somewhere around 10 kW to maybe maximum 100 kW). There are several example available, for instance this product of InnoVentum. Well, I was wrong: I see that some years ago (2012) a Vensys 77 1,5 MW turbine has been installed on a 100 meters tower. That is quite a number: a 77 meters rotor is considered small for today standard, however it fully qualify as a “utility scale” solution. This full scale prototype followed a 25 meters test tower built by the same companies some years before. 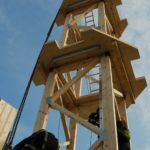 Developed by 2 German companies (TimberTower & TiComTec) it has been built near Hannover. The foundation is standard (concrete) and the connection between the tower and the foundation is made trough 4 meters long steel rods. With a somehow unusual octagonal cross section the tower diameter is comparable to a standard concrete or steel solution. I see however that other geometries are possible (hexagonal or dodecagonal). The life span of this solution looks similar to the steel alternative (20 years). Unfortunately I haven’t been able to find information regarding the cost. 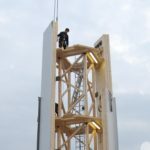 For the sake of clarity it is not 100% wood – few steel elements are used inside the tower. Some weeks ago I have discovered that, as I am currently enrolled as a university student (getting “slowly but steady” a second degree in Economics) I have full access to the Elsevier database. This is an enormous amount of information, including all the best scientific papers and technical articles published by industry journals. I am using this possibility to learn more and stay updated on several niche topics that I found interesting – from recycling of wind turbine to bird strikes to foundations pathologies. Browsing the database, I recently stumbled upon an interesting article published by Jack McAlorum et al. from the University of Strathclyde (Glasgow). The paper is called “Deterioration of cracks in onshore wind turbine foundation”. 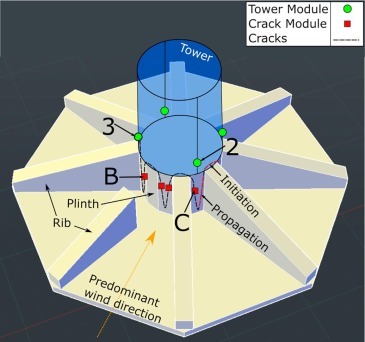 The authors instrumented an octagonal slab foundation (sometimes called “star foundation” or “wall foundation”) to monitor the evolution of existing cracks. The paper does not specify the reason for the cracks. However, as typical, the most severe cracks were in the side of the wind turbine facing the wind (as the concrete is in tension there). What it is interesting is the fact that the behaviour of the foundation has been monitored for a very long period (over 9 months) and under standard operating conditions. 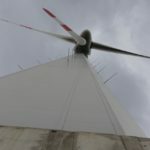 This is very unusual: while other key component of the turbine like the gearbox are constantly monitored and the data is collected trying to detect problems and predict failures, I have never heard of such monitoring for the foundation. Additionally it is interesting the type of sensor used: instead of standard accelerometers or strain gauges the researchers used a strain sensor based on fibre-optic called “fibre Bragg gratings” (FBGs). 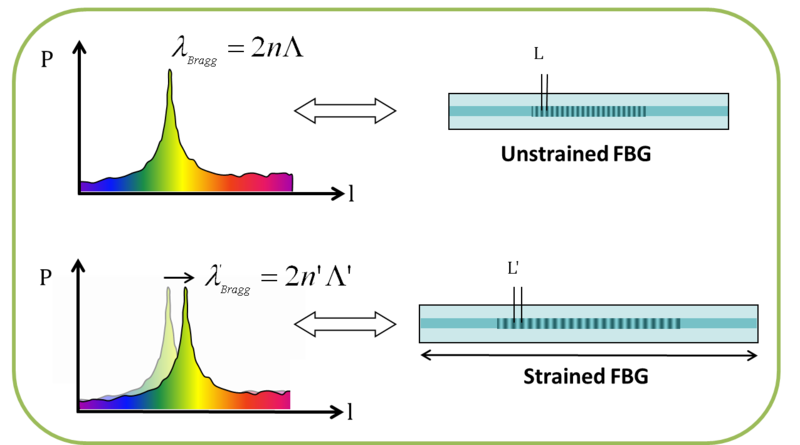 Basically it is a sort section of optical fiber treated in a way that some specific wavelengths are reflected and some are transmitted. 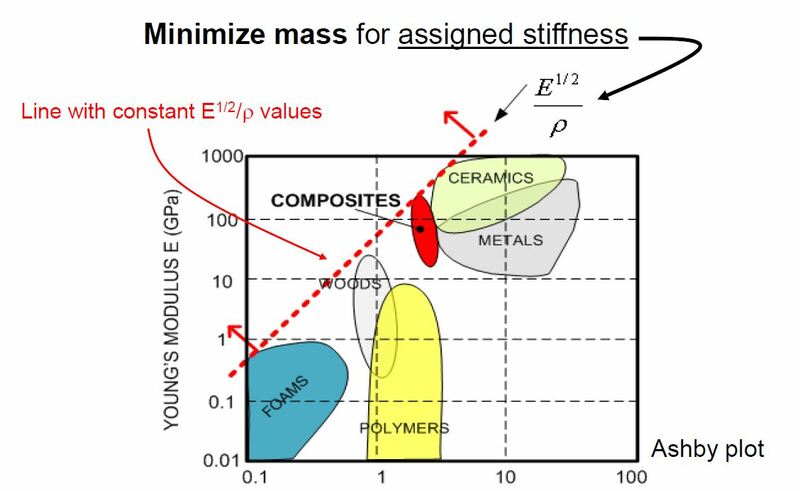 They can be used as a strain sensor because when they are deformed the transmitted and reflected wavelengths shift, allowing a calculation of deformation. Through the monitoring period no significant evolution of cracks was observed. Basically, the wind turbine owner was lucky: cracks did not deteriorate and no intervention was needed. Unfortunately, the cost associated with the monitoring are not shared, so it is difficult to make a business case (cost of immediately repairing the cracks with grouts or epoxy resins vs. cost of monitoring to see if the intervention is needed). I also see that this solution only allow monitoring visible cracks. This is a strong limitation, as several failures originate in a non-visible area of the foundation. Said that the idea is certainly interesting and useful, above all considering that some turbine are kept in operation for a very long time, even exceeding the design life of the foundation (usually 20 years). The serial defect clause is a warranty frequently requested by customers. General warranty, for defect in design, manufacturing, installation, etc. Generally speaking, a serial defect is a component defective on a significant number of turbines. If there is a certain percentage of defective components, the warranty force the turbine seller to replace it on all the turbines. As you will imagine, the tricky part is the specific definition of the clause. The definition of defect / defective. The time-frame for the defect to appear. How many years? The reason for the defect. Is the root cause the same? You can have for instance many blade failures caused by different problems. The percentage of failures needed to declare a serial defect. Is it 10%, 20%, more? The population of turbines used to calculate the percentage of failure. Only the wind turbine in the wind farm, all the turbines of the same model owned by the customer, all existing turbines of the same model? Who should confirm the existence of the defect. A reasonable compromise for this point can be an independent third party. The reason behind this clause is that such serial defects happened in the past - not only in the infancy of the wind industry, but also in more recent years when components have been replaced on massive numbers of turbines, even of Tier 1 manufacturers. 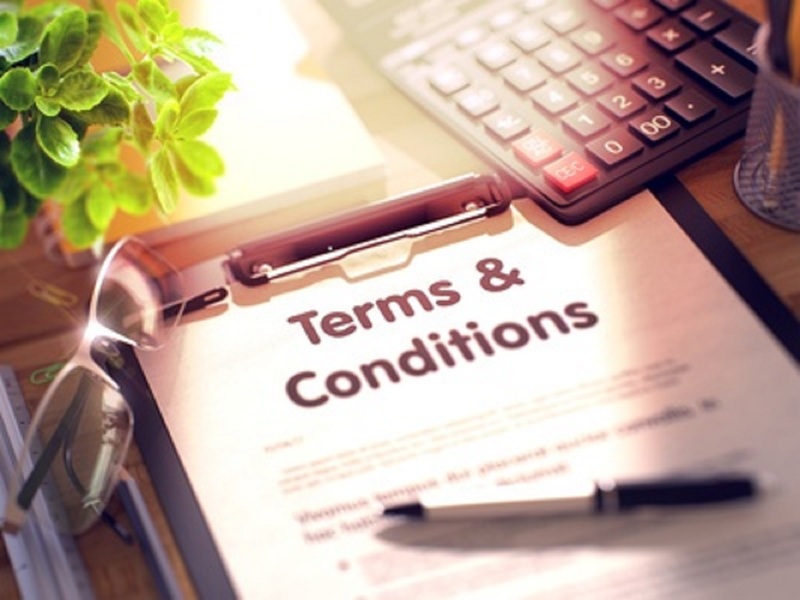 Without this clause the buyer can be left in a very uncomfortable situation where maybe he is aware of the (latent) problem but only if the components that fail during the Warranty or Service period are replaced. Transfer of title and transfer of risk are 2 key concepts in wind farms contracts (and, presumably, in many other comparable businesses). They appear in both EPC and Supply Only agreements. Transfer of title (ToT): the ownership (of the entire turbine or of one of the component of the wind farm, such as the foundation) is transferred to the buyer. Transfer of risk (ToR): risk of damages and losses is transferred to the buyer. Although it may look counterintuitive they do not have to happen at the same point in time: for instance, an EPC contract could have transfer of title when a certain percentage of the wind turbine is paid -for instance, 80%- and transfer of risk only after commissioning (that is, the turbine is installed, tested and ready for production). When the relevant percentage is paid is defined in the projects cash flow. In general, it could happen that the transfer of title happen many months before wind turbine installation. The percentage of the wind turbine price to be paid to have transfer of title is usually one of the key negotiation topics. For the sake of clarity, the wind turbine seller would retain some case of security (e.g. a bank bond) until the equipment is paid in full in case the buyer stop the payments after the transfer of title. It is worth to notice that one party (or both) might be interested in an early ToT or ToR, for instance if they are linked to revenue recognition. For instance, in some Supply Only or Supply and Install contracts revenue recognition is at ToR, so the turbine seller want to have it as soon as possible. For a variety of reasons, it could be the buyer interested in an early ToT or ToR, possibly even before the completion of the wind farm balance of plant (basically, when the wind farm is not ready for installation). In a similar scenario the turbines would be delivered to a temporary storage area where the ToT and ToR would happen. One more interesting point is that, in some jurisdictions, a sales tax could become applicable when the ownership of the turbines is transferred. This could be a good reason for an early or late transfer of title in a different jurisdiction. Lately I’ve been spending some time trying to learn something more about quality. 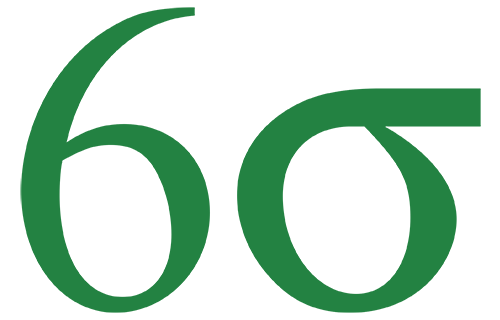 Although I see that there is no consensus on the business effectiveness of some of these technique I’ve decided to take a certification (ASQ Six Sigma Green Belt) to have a first-hand experience. “Defect” is defined as a non-conformity, a failure to comply with the Technical Specifications, a flaw in design, manufacturing, workmanship or damage. “Defective” is defined as a part that has one or more defects and fail due to it. The key concept here is that in principle it is possible to have one or more defect on a component without having safety or operational problems. Wind turbines warranties (and presumably other similar equipment) usually are based in the concept of defective – that is, of failure of the component to operate correctly. The logic is that a failure is usually a black or white concept: either the gearbox is working or it is broken. However, seen from the perspective of the customer, this definition is not reassuring: a component could have a defect that, even if it’s not preventing the turbine to work, is making it underperforming, unreliable, deteriorating quicker than usual, etc. Basically the concern of the customer is that the turbine seller will simply “try to keep the turbine alive” until the defect warranty expire (usually after 2 years). Afterwards, it will become a problem of the customer. Obviously the last one is very onerous for the company who has to mantain the turbine, while the second can offer a reasonable level of protection to both parties. A reader of the blog shared the link of this video, showing the controlled demolition of a wind turbine in the UK. The turbine looks like an old Acciona Windpower model. As you will see, the turbine is connected using a rope to a back hoe and the base of the tower is slowly cut using a blowtorch. Then the backhoe start pulling, and the turbine fell to the ground pretty much like a tree. Environmental impact. Not only the turbine destroy a bunch of trees but above all after the impact with the ground the debris flight everywhere. I assume that the area can be cleaned afterwards – however filling the area with fragments of different materials looks like a suboptimal solution to me. Safety risks. You will notice that at the minute 3:00 one of the blades hit the ground and detach itself from the rest of the turbine, moving in the direction of the backhoe. 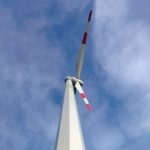 An objection can be that the rope can be long enough – however giving the geometry of the turbine and its different materials, I still see the residual risk of flying fragment hitting the operators. I would recommend the “component by component” dismantling. We used this solution in a wind farm in Portugal and I believe it is much safer. To see an intermediate solution (partial dismantling and partial demolition), have a look at this other video. It is the repowering of El Cabrito, a very old wind farm near Tarifa (south of Spain). By coincidence, that area is also one of my preferred holyday destination, so I have several pictures of the old turbines. You will see how the crane dismantle the blades and the nacelle. Subsequently, a different tool is used to crash the tower.